​The historic octagonal bandstand with its distinctive red and white roof is located in Lakeside Park. It was built around 1900 with funding for it donated to the city by William McDermott, a well known local resident. The architect was Hiram P. Thompson and since then, no major changes have occurred, The Local Historic Designation Booklet, page 3, devotes a story about its development along with color photographs. It has been designated an Historic Site by the Fond du Lac Preservation Commission. 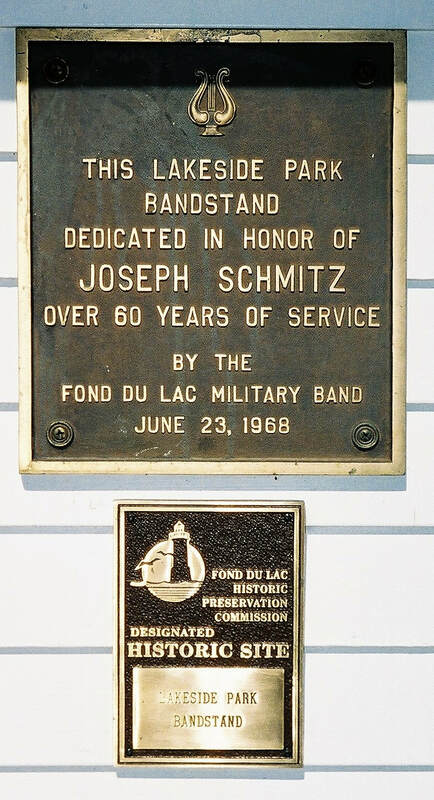 In 1968 the bandstand was dedicated in honor of Joseph Schmitz for over his 60 years of service with the Fond du Lac Military Band. ​The bandstand is now used annually for a a 4th of July concert. A clock located on the path approaching the bandstand.